All India Radio, Guwahati will soon launch its own FM channel. The channel will be on air from September this year. 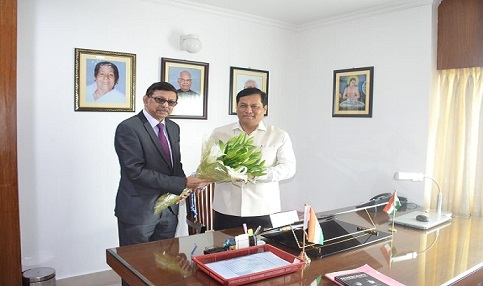 Chairman of Prasar Bharati Board Dr A Surya Prakash called on Assam Chief Minister Sarbananda Sonowal at his official residence at Kharghuli on Tuesday and informed him about this. Dr Surya Prakash during his maiden visit to the state as chairman of the regulatory body of Doordarshan and AIR also said a proposal to launch a new channel of Doordarshan for Assam is under active consideration at the Information & Broadcasting Ministry. Prasar Bharati runs a channel covering all the north eastern states under DD North East and soon a separate channel for the state would be commissioned, he added. Chief Minister Sonowal during the discussion highlighted the role that the media wings of the Prasar Bharati could play in projecting Assam and the northeast in the national landscape. Sonowal also emphasised adopting a more aggressive agenda by the government media agencies to sustain and excel in today’s competitive world of media. He also underlined various initiatives being implemented in the state under the guidance of Prime Minister Narendra Modi and the progress made in different fields so far. In response to Chief Minister’s requests, Dr Surya Prakash informed that Prasar Bharati is already planning to telecast programmes of all the DD Kendras in its DTH platform so that viewers from all over the world could enjoy different regional programmes along with the national telecast.